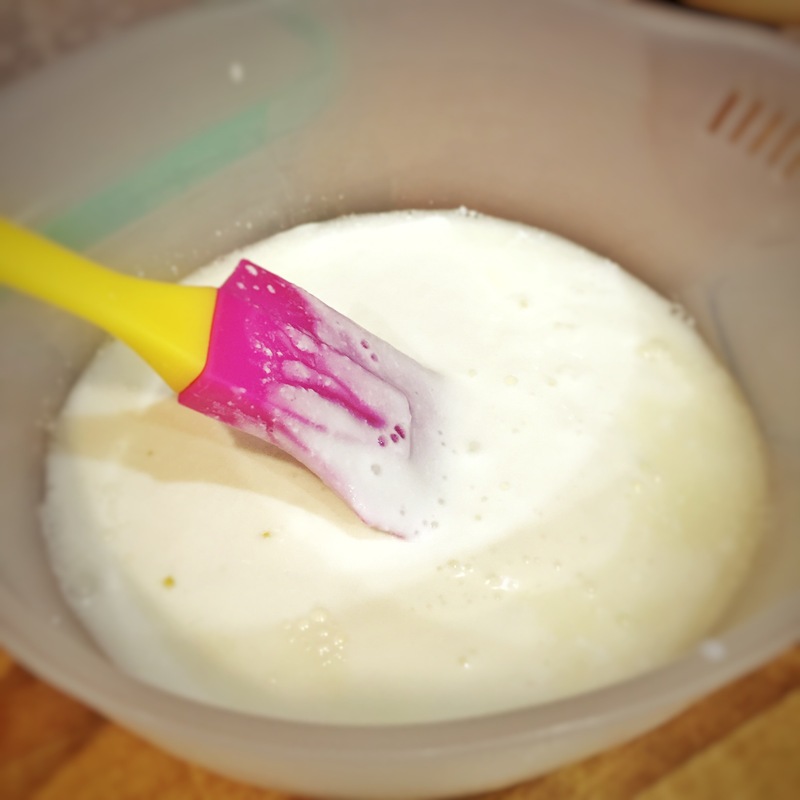 How I got started on Milk Kefir! Wow! I’ve taken such a long break from blogging. My phone is bogged down with so many photos which I’ve stored for my blog articles which I’ve no time to write. I’m blaming it all on my holiday and procrastination. Anyway, here’s something on what I’ve been up to lately. Milk Kefir! In a nutshell, the good bacteria in Yakult and Vitagen? That’s it! Minus the high sugar concentration in these 2 drinks. It all started when I was lamenting about the expensive probiotics that 宝贝 was taking to keep her eczema from flaring up. And hopefully, to introduce enough good bacteria into her system that she outgrows her food allergies. 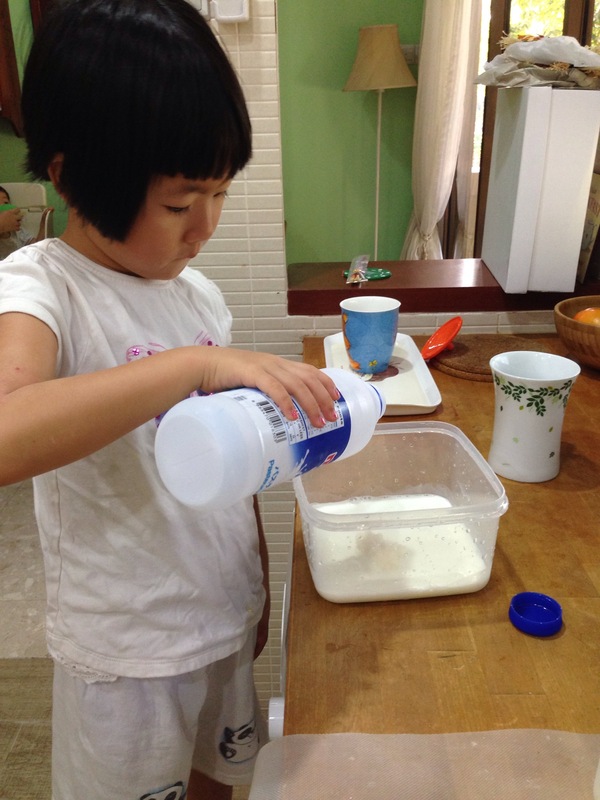 Her mom managed to get some kefir grains from her friends and has been making kefir for them. Her son’s eczema condition has improved tremendously after eating it. I have read about people cultivating their own kefir but I never thought it could be done in hot, humid Singapore! So she kindly gave me some starter kefir grains, with very clear and explicit instructions on how to do it. She even lent me her plastic sieve as I only had metal ones at home. I bought the equipment from Daiso a few days later. So I’ve done a few rounds of it and glad to say, my kefir grains are still surviving!!! ✌️Thanks Celly!!! It simply tastes like original yoghurt. Sour loh. Only 小小宝贝 eats it in its original condition. Don’t ask me how he does it! He simply loves it!! The rest of us eat it mixed with fruits or cereal! So how to go about doing it?? This is what the kefir grains look like. The bunch of spongy curd in the container. Pour milk over the kefir. 100ml of milk for every 10g of kefir. It’s so easy that 宝贝 can do it too!! Cover the container and leave a little gap so that the gas produced during the fermentation can escape. Or else you will be faced with a minor explosion of fermented milk in your cupboard… Something that I don’t look forward to. Leave it in a dark and cool place. I leave it in my cupboard that’s not frequently used so that it’s not disturbed. If you want it to be more liquid (smoothie kind), take it out after 2 days. I prefer it to be more solidified so I “harvest” it after 3 days. This is what it looks like after 3 days. Filter it with a plastic sieve. The filtered part is what I add into fruits. I’m left with the kefir grains after the filtering. Here we go again! When my kefir grains propagate, I can give some away so that everyone can benefit from it. Hope they grow up soon!!! Thanks for all the comments and feedback left by my readers! 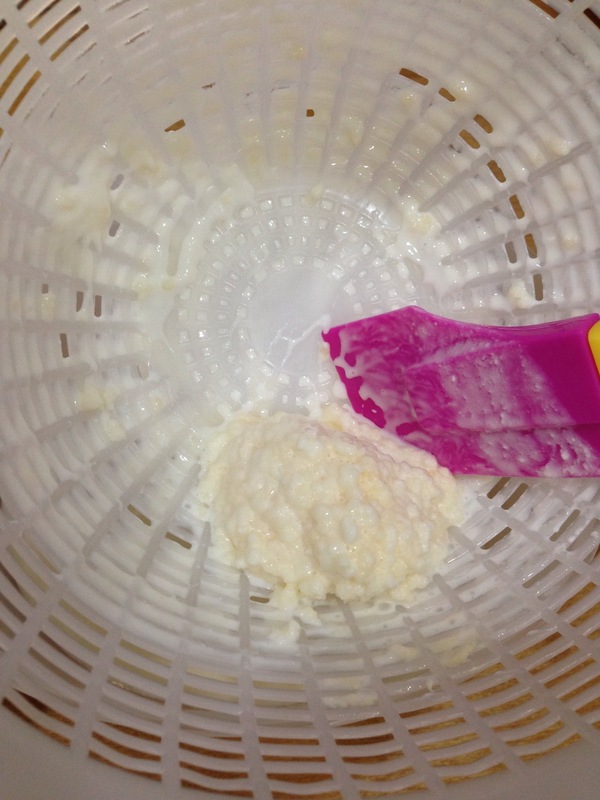 Check out this link for more information on how to cultivate kefir and even recipes with it. This gets more interesting every day. After I started talking to people about kefir, I found out that kefir grains are being sold at Tekka market! So if you are in Singapore, head there!! 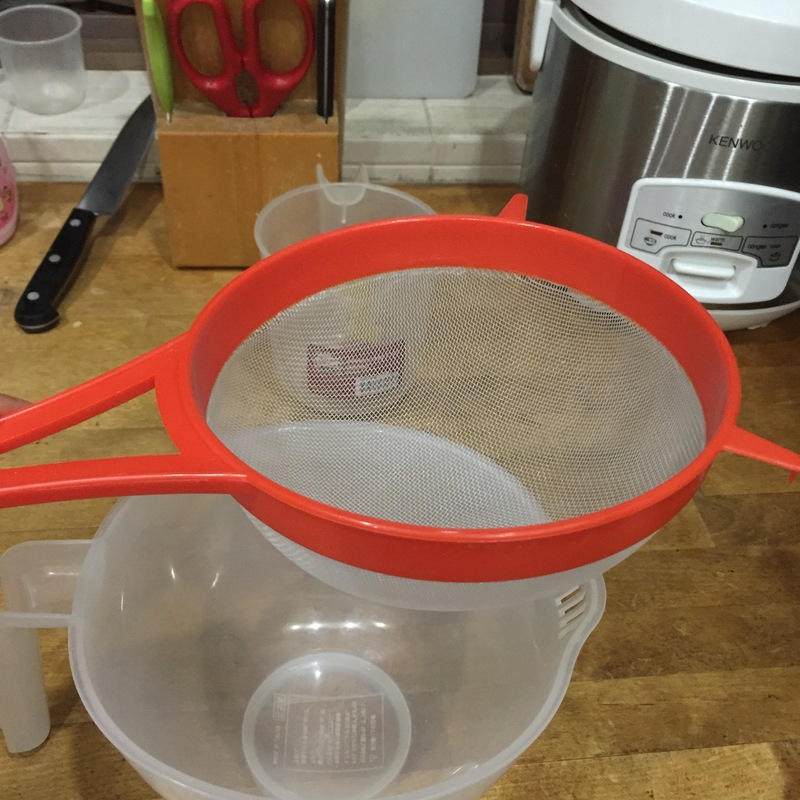 I have since, changed to this plastic sieve and I stopped losing every single precious grain. I have also changed my fermentation time to half a day. This is also dependent on the weather and location. As Singapore is a warm country, the fermentation time tends to be shorter than in temperate countries. If you like a more sourish taste, then you can leave it out for 1 full day. I have taken it out of the dark cupboard and left it on my kitchen tabletop so that it’s more convenient. Therefore, the fermentation temperature is higher than the dark cupboard as well. These are some contributing factors. I have also switched to glass containers to house the kefir. Plastics are generally pretty stable and shouldn’t react with the kefir, but since I have glass containers at home, I use them instead. Put the kefir grains in a glass container with a wide opening. I’m using a pyrex glass container. 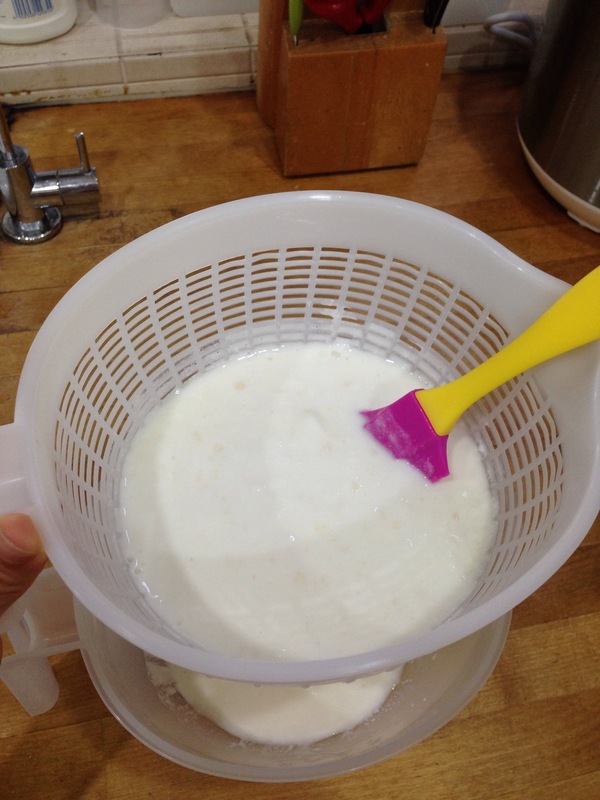 For every 10g of kefir grains, pour 100ml of milk over them. Leave them to ferment in a cool place, away from the sun. Fermentation time depends on temperature. Optimal temperature is around 22-25 degrees C. For Singapore weather, fermentation time is around half a day. If you like it to be more sourish, then ferment them for 1 full day. Sieve the grains using a plastic sieve with fine holes. Kefir is ready to be eaten. Store them in the refrigerator. Put the kefir grains in a glass container and repeat step 1. Please check out my website Craft & Culture! There’s a wealth of information on cultured food on it and its facebook page. 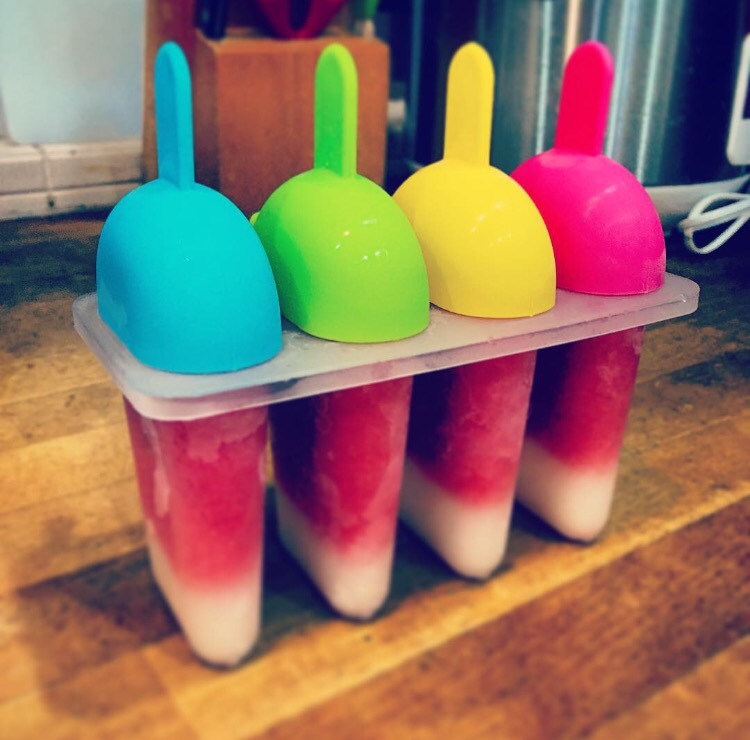 The things I do with Milk Kefir! Yums! Don’t make the same mistake as I have done. 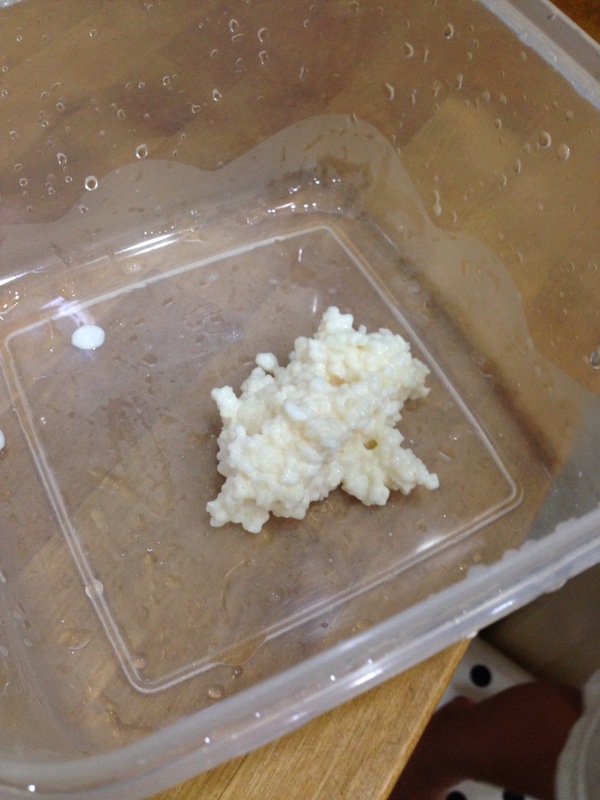 My poor kefir starved to death…. Temporary stopgap measure to continue with milk kefir cultivation while waiting for my new kefir grains. Yep! 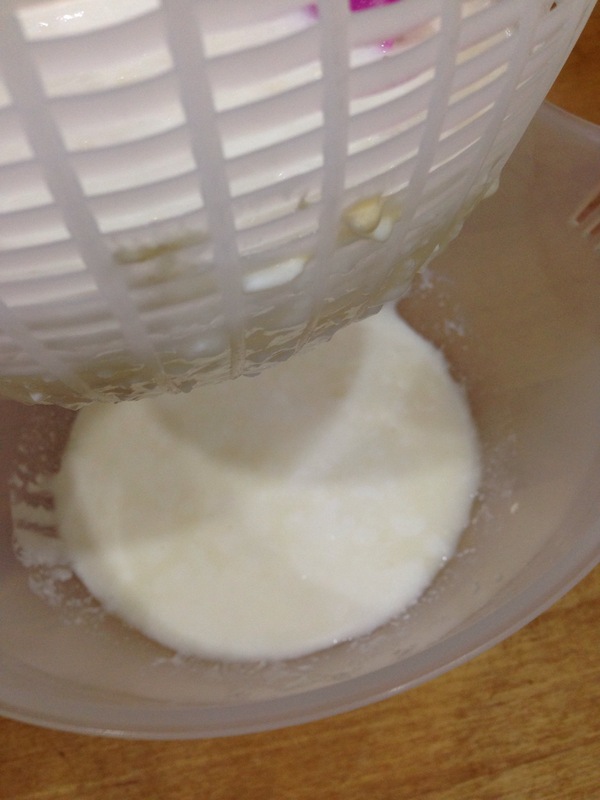 I continued cultivating milk kefir without the grains.